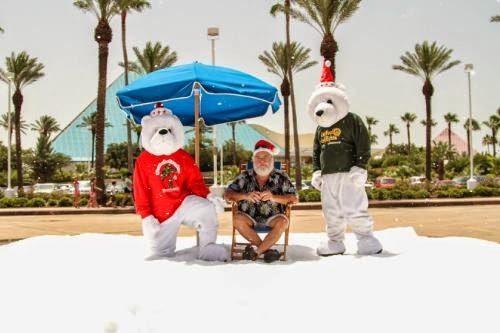 Galveston, Texas: Moody Gardens will transform into the premier holiday destination with the debut of ICE LAND: Ice Sculptures featuring Christmas with SpongeBob SquarePants on November 15. Being the only holiday ice exhibition on the Gulf Coast, this vast and amazing display of magnificent ice creations will add a frosty new addition to the Festival of Lights and other holiday attractions this year. A skilled team of 20 professional ice carvers from Harbin, China will take 900 tons of ice and transform them into majestic marvels ranging from holiday-themed sculptures to a wide range of scenes featuring the beloved underwater characters from SpongeBob SquarePants. Chilled and held at a temperature of 9 degrees, you can witness these works of art within a 28,000 sq. ft. insulated tent structure located on the property. This holiday treat for the whole family will be open through January 4 as Galveston makes its holiday transition into a Winter Wonder Island. "We are very excited to bring such a unique experience to south Texas," said John Zendt, Moody Gardens President and CEO, who added that carving giant ice sculpture scenes and holding them at 9 degrees outside on a sub-tropical island is a significant logistical challenge. "Our guests are in for a special surprise. There is no other venue in the Southwest that offers such a diverse range of activities and amenities for a complete holiday experience."